For the September dinner@Tate's I needed a dessert I could make the day before and a dessert that felt light since it was following a pretty heavy meal. These seemed to fit the bill perfectly plus, cupcakes always seem to be a crowd pleaser - I think partially because it feels like portion control! Now, as I've stated in past posts, I really do not like making cupcakes, but I had to give these a try since I love lemon anything. And they were so pretty. And I could make them a day ahead - except for the frosting part. So it seemed like a win, win all around. whisk flour, cornstarch, baking powder and salt. in different bowl - whisk the sugar with the eggs and vanilla until smooth and slightly thickened. add the melted butter and oil and mix until completely incorporated. add all dry ingredients and milk in alternating batches - mixing well between each addition. fill muffin tins about 2/3 full. bake at 350 for 15 - 17 minutes. in a small bowl add 2 tablespoons water - sprinkle the gelatin across the top and let sit 5 minutes. in a small saucepan - low heat - add cream cheese, lemon curd and lemon zest. once all the cheese is melted add the gelatin mixture. continue to cook on low- stirring constantly - until the mixture is smooth and glossy. in a stand mixer - beat the egg whites until foamy. add the 1/4 cup of sugar. when the whites are stiff, turn the mixer to low and slowly pour the cheese mixture down the inside of the bowl. turn off the mixer - using a rubber spatula - gently fold all of the egg whites and cheese mixture together until no white streaks remain. in a small saucepan combine the sugar and water and bring to a boil over medium heat - stirring constantly - until all sugar has dissolved. in a stand mixer - beat egg whites and cream of tartar until soft peaks form. with mixer on medium speed carefully pour the sugar mixture into the egg whites. continue beating until frosting is cool and billowy - 5 or 6 minutes. add the lemon zest and juice and beat until combined. ready to put all this craziness together??? 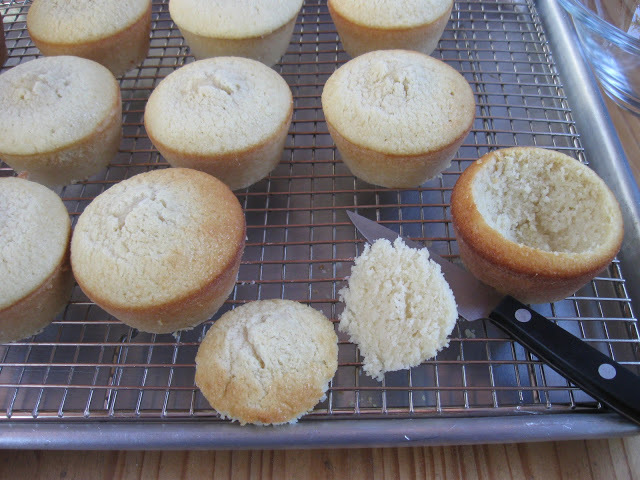 carefully slice all around the top inside edge of the cupcake - at an angle. same concept as the way I do the Boston Cream cupcakes. fill the centers with the cheese, lemon curd mixture. place on the hats back on. top each cupcake with frosting - I used a spoon instead of piping because I liked all the stickyuppy parts - do whichever way you like best. place all your cakes on a tray. stick under the broiler until peaks are toasty. remove and let cool just a couple minutes.